Looking for an alternative to rice based sushi rolls? 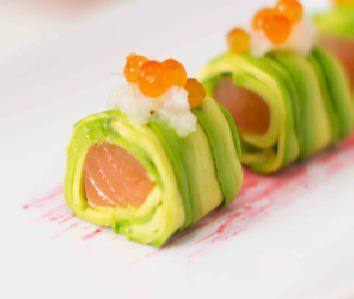 Chef Devaux’s esthetically stunning Alaskan Avocado Roll is a delightfully light and tasty appetizer composed of succulent sushi grade salmon, enveloped in wafer thin slices of avocado. Topped with sweet daikon, and a little salmon roe, the rolls are set upon a streak of raspberry jelly for added wow factor! Sit the avocado in the palm of your hand, and with the knife, make a deep incision along the length (until the knife touches the stone). Slowly turn the avocado, allowing the knife to follow its natural curvature, until you reach your starting point again. Separate the two halves by grasping each with one hand. Begin twisting both halves in alternate directions, until they come apart. To remove the stone, simply jab the heel of the knife into the stone and turn. The stone should come away with ease. Discard one half. Peel the remaining half of the avocado by grasping the skin at one end between your thumb and forefinger. Pull it back slowly, taking care not to damage the flesh beneath. Lay a large, square piece of cling film on one side of your chopping board. On the other, begin preparing the avocado. Position the avocado at a 45-degree angle so that the length is in front of you. Slice off a little from the edge and discard. Support the avocado with all four fingers, and with a sharp knife, begin making wafer thin slices a few millimeters in thickness. It may help to rest the upper blade of the knife against your finger knuckles for greater control when slicing. Use the entire half of the avocado. Arrange the avocado slices in a neat, overlapping row of ten on the cling film. Create a second row beneath, allowing the tops of the slices to overlap the upper row also. Use the remaining slices to create a ‘connector row’ between the upper and lower ones. This will add strength to the sushi roll structure later. Position a long, thin piece of sushi grade salmon filet atop the first row of avocado – ideally just where it meets the connecting row. Then, lift up the edge of the cling film closest to you, and freehand roll the avocado around the salmon filet. Remember to lift up the edge of the cling film as you roll to prevent it from curling under. Apply pressure with your fingers to firm up the contents as you roll. With a moistened knife, trim off the untidy ends of the sushi roll. 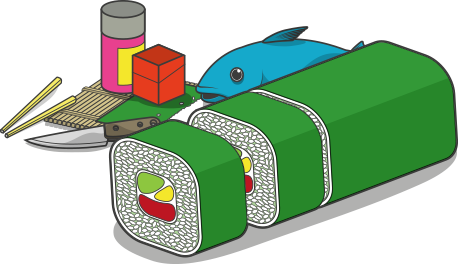 Then, cut the sushi roll into four equal sized pieces. Set aside briefly. Position two glass bowls in front of you, then transfer the thawed raspberries to the sieve. With the flat of a metal spoon, begin squashing the raspberries through the holes in the sieve. Allow the juice to collect in the large bowl. Scrape the residue from the underside of the sieve into the second glass bowl. This latter residue is far thicker than the juice, and will set similarly to jelly. With a clean paint brush or basting brush, paint one or two strokes of raspberry jelly onto the surface of your presentation plate. If necessary, allow any excess to drip off into the bowl first. Set the plate to one side. Using a pair of chopsticks, transfer the avocado roll pieces onto the raspberry brush strokes. Position them side by side, roughly half an inch (2.5 cm) apart. When picking up the slices, be sure to do so with the chopsticks either side of the salmon, to avoid them slipping off. Cut and peel a small piece of daikon. With a micro plane or cheese grater, shred a small quantity using the finest blades. Transfer a small quantity to the top of each avocado roll using the chopsticks. Garnish further with 2-3 salmon roe per slice. You may wish to use the chopsticks for this also, applying pressure, if needed, to help them stay in place. May 11, 2013 Salmon "Sake"